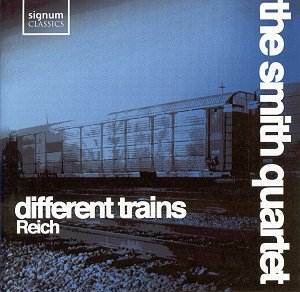 Reich�s Different Trains is fast becoming his most popular work, certainly on disc. This is at least the third recording of it, though if we discount the orchestral version, the Smith Quartet�s main competition is from the group who commissioned it (and so much other core modern repertoire), the redoubtable Kronos Quartet. The Smith Quartet also has a formidable reputation in the world of contemporary music and these excellent performances can bear comparison with the best. Indeed, there is a very complimentary note by Reich in the booklet to this new release, praising the Smiths and the interest the group has taken in concentrating on his music. Different Trains contains all that is familiar about Reich�s style. You will find it hypnotically mesmerising or maddeningly repetitive, depending on your viewpoint. It is certainly one of his more personal statements, drawing upon childhood memories for its basic inspiration. Technically it has its roots in the earlier compositions It�s Gonna Rain (1965) and Come Out (1966) in its use of carefully chosen speech patterns that intermingle with live and pre-recorded string quartet sounds. However, the speech extracts that generate the musical material here are what matters. Three very different train journeys are conjured up � the first (America: Before the War) shows us the boy Reich being shunted between his separated parents in Los Angeles and New York in late 1930s and early 1940s. The second part (Europe: During the War) shows what train journey he might have taken as a Jewish boy had he lived in Central Europe during the same period. The third part (After the War) tries to present an essentially optimistic picture of a brighter future. The voice extracts feature his elderly Governess, a retired Pullman porter, Holocaust survivors and a mixture of train sounds recorded in the 1930s and 1940s. It�s essentially a multi-media piece that can include video footage; the Smiths have even performed it suspended above the tracks of Cologne�s Hauptbahnhof, which I bet Reich would have loved. Easier to admire than love, there�s no doubting the superb playing here, the Quartet captured in vivid sound. The short Duet is dedicated to Yehudi Menuhin and scored for two solo violins, four violas and four cellos, here double tracked by the Smiths. It�s more reflective and gentle than some Reich (including the other works here) and makes an admirable contrast, a sort of reposeful interlude. In the energetic Triple Quartet, another Kronos commission, the Smiths go a stage further in being triple tracked. The basic inspiration here is the finale of Bartók�s Fourth Quartet, so we get an abundance of Bartókian ideas put into the minimalist melting pot; dissonance, pulsating rhythm and repetition of short melodic cells � an ideal starting point for Reich�s style! The disc is pretty short measure, though one could argue that with this sort of music a small amount very well performed is preferable to a huge unpalatable dose. Recording really is exemplary and notes by Reich himself all one could ask for. Given the Kronos�s different coupling, Electric Counterpoint, one could make the case for this disc as the near-ideal representation of Reich�s considerable contribution to the string quartet genre. If you�re into Reich, don�t hesitate.